I arrived in Willow and met K.K. (Kimberley the Kardlady) in person for the first time. She is a crafter, running a foil printing business, Kolorful Kreations, and is also a big fan in the local music scene; frequenting a lot of the festivals and venues. She helped me a lot in lining up a quick series of local performances. I performed almost continuously, doing both day and evening shows. I made a good connection at Mead's Coffeehouse in Wasilla. I almost played at their opening when I was in Alaska in '98, but I left before they could get through all the delays involved in openning a new place. The owner, Brian Mead, is trying to develop it not only as a venue, but as a place for musicians, and all types of artists, to meet and socialize, as well as jam and perform. He wants to get digital recording equipment and become a serious live recording venue as well. He is hoping to create local radio programing too. So I was right on time. 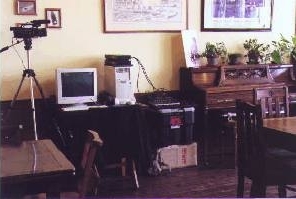 After one performance, I came back later and arranged to set up my recording gear at the coffeehouse for a few days. He could check out a working example of what he was thinking of, hands on. I could do one of the things I got the gear for, to be able to set it up and record the live performances at places like coffehouses.